Recently in Ontario, we have seen several fires which have resulted in the loss of life of many animals, including goats, pigs, and racehorses. This is a terrible circumstance, which impacts the daily lives and livelihoods of the people who own and are in charge of these animals. 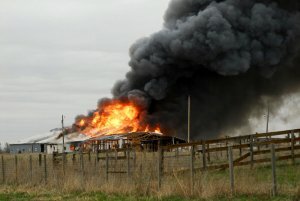 Annually, $30M in losses per year are reported as a result of barn fires.. Due to the nature of a barn, its construction, and the contents within the barn, left unchecked a fire can spread extremely quickly and cause massive damage. Water Supply for Fire Fighting. While all of the information within this document is excellent and should be seriously considered, Fire Monitoring of Canada would suggest one addition: the addition of fire alarm monitoring and/or fire sprinkler monitoring that conforms to CAN/ULC-S561. Nowhere within this document is the idea of monitoring discussed specifically, and we feel that this is a very important link in the chain to get the fire department to your site. Consider that most barns are not attended (by people) 24 hours a day, 7 days per week, 365 days per year, and many are located away from buildings where people may be living and sleeping. In the event of a fire within the barn happens when no one is around to see it (and then subsequently notify the fire department), how will the fire department ever know to come and help without fire alarm monitoring or fire sprinkler monitoring to ULC-S561? Also, if a fire did start, people on site are likely not going to call 9-1-1 immediately as they attempt to remove animals from the barn before the spread of the fire gets out of control. Fire Alarm systems are local systems and without a specific fire alarm monitoring system, or fire sprinkler system, the fire department may never know an alarm has sounded in the barn until it is too late. We know that fire doubles in size every minute after the first four minutes, so every second counts in getting the fire department to the site. We know that fire alarm monitoring and fire sprinkler monitoring which conforms to CAN/ULC-S561 requires all fire alarm information to be relayed to the fire department within 30 seconds, without verification. This ensures that even if there is no person on site within the barn, in the event of a fire the fire department can still be dispatched quickly to the site to attempt to mitigate any incident. This timeframe can be significantly reduced by using OPEN ACCESS™ fire alarm monitoring. What Goes into a ULC Fire Alarm Monitoring Installation? There are many ways to reduce the impact of a fire on site, but the impact of all of them become lessened if the fire department is not notified of the event quickly so that they can attend and put their excellent skills to work to mitigate the fire. If you are considering upgrades to your barn fire protection, do not forget to add fire alarm monitoring and/or fire sprinkler monitoring which conforms to CAN/ULC-S561, and even better inquire about OPEN ACCESS™ fire alarm monitoring. Contact us to find out how we can help get the fire department to your facility with fire alarm monitoring and fire sprinkler monitoring which conforms to CAN/ULC-S561.